There are so many benefits to get your kids to help you cook. Once you get them in the kitchen, it is helpful to have products that are made specifically for kids to keep them safe. These kids' knives options will help your kids to learn proper technique and responsibility with knives while keeping their little fingers safe. There are a few different options for kids' knives. In choosing what knives are best for kid chefs, you want to consider which ones will do the job of cutting, but will not cut flesh. There are many nylon knifes options. Nylon is durable thermoplastic material that can bend without breaking. It also will not absorb oils or other liquids. It has a high melting point and does not contain BPAs. This is why nylon is such a great material for kids' knives. You also want to pay attention to the handles for little hands. Having a rubber or soft grip is important for your kid to be able to handle the knife with precision and not have any slips. 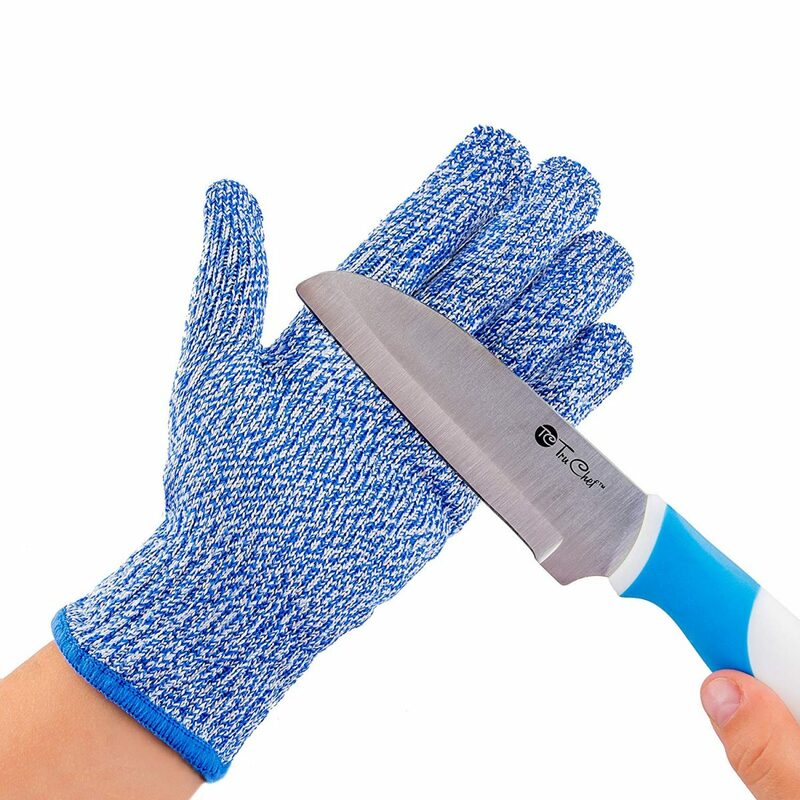 Rather than buying nylon knives, you can buy knives with finger protection, chopping tools that are not sharp, and gloves to protect little hands from cuts when using steel-blade knives. Check out all the kids' knives options below. There are many nylon knife options for kids. However, we like the Curious Chef three pack. Curious Chef is the best brand for kids' cooking products. They make oven mitts, measuring cups, cooking kits, etc. 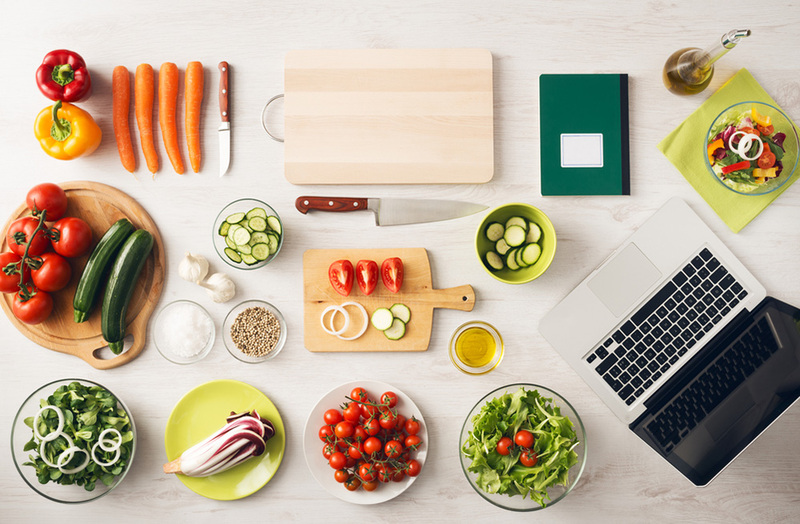 Check out our article about kids cooking for more products. 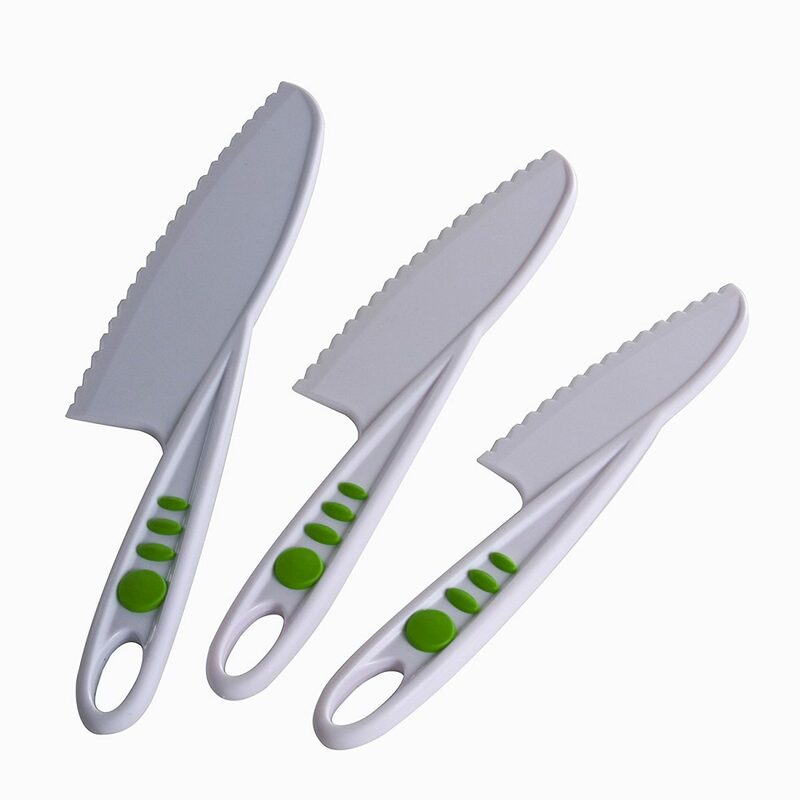 This 3 pack of nylon knives is perfect for little ones to start cooking. They are dishwasher safe and good for ages 5 and up. They have soft grip buttons for little hands. Your kids can get practice with 3 sizes: small, medium, and large when cutting fruit and veggies. This is the next option for kids' knives. It is a chopping tool that is safe for kids to use because it is made out of wood. 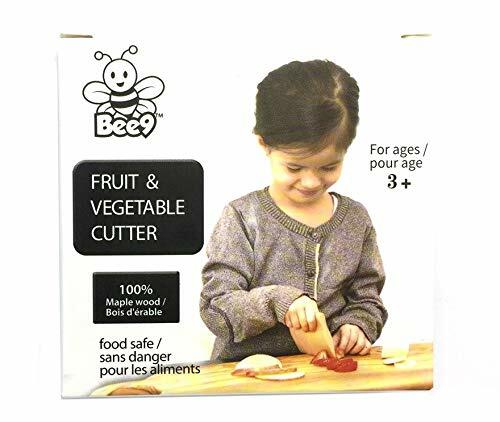 It is non-toxic and can cut veggies, fruit, and cheese. It helps improve kids' dexterity. This chopper is the best option for very little kids. Even two-year olds can use this to help in the kitchen. 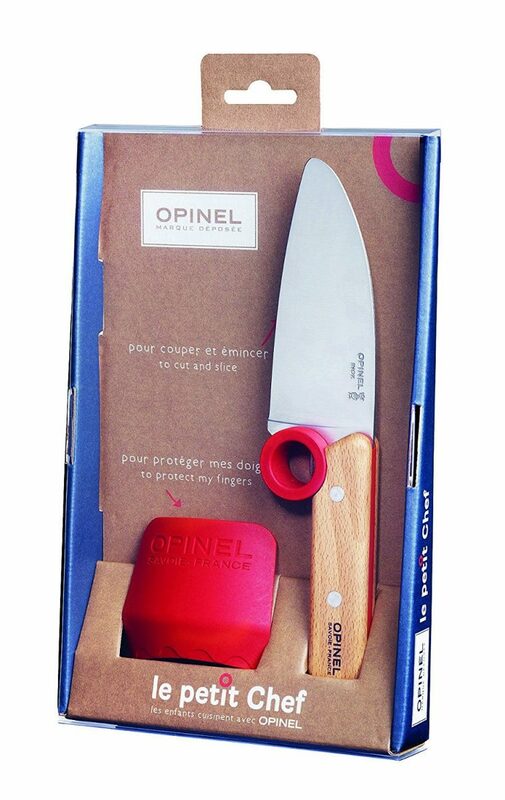 This is another great option for kids' knives. This is a real steel-bladed knife that has a plastic hole where the child can put his finger so he does not have to touch the blade. It also comes with a finger guard for the other hand when holding the veggie or fruit. So your child can practice with a real knife without worrying about slicing his skin. However, it is best for kids over the age of 6. These gloves are a good idea for all kids cooking. They will add extra protection even with the nylon knives. They come in sizes for kids aged 4-12. They meet the most rigorous standard for cut resistance. They are easy to clean and come in different color options. This will help kids learn to cut with real knives while being safe. Cooking with your kids helps them to spend more quality time with their parents. It fosters cooperation and communication with the whole family, including siblings. Cooking from scratch allows kids to see for themselves the difference between real food and processed foods. It is much healthier for their growing bodies. Rolling, stirring, measuring, sprinkling are just few kitchen tasks that allow young kids to improve their fine motor skills. What kid couldn’t use a little more practice in this area? They will need to follow the recipe. If they don't, they will learn the consequences in the end result. Check out the above recommended kids' knives options for cooking with kids. These knives and knife accessories will help your kids learn how to chop and slice more safely. Obviously, the best safety precaution is adult supervision so stay close while your kids are cooking. 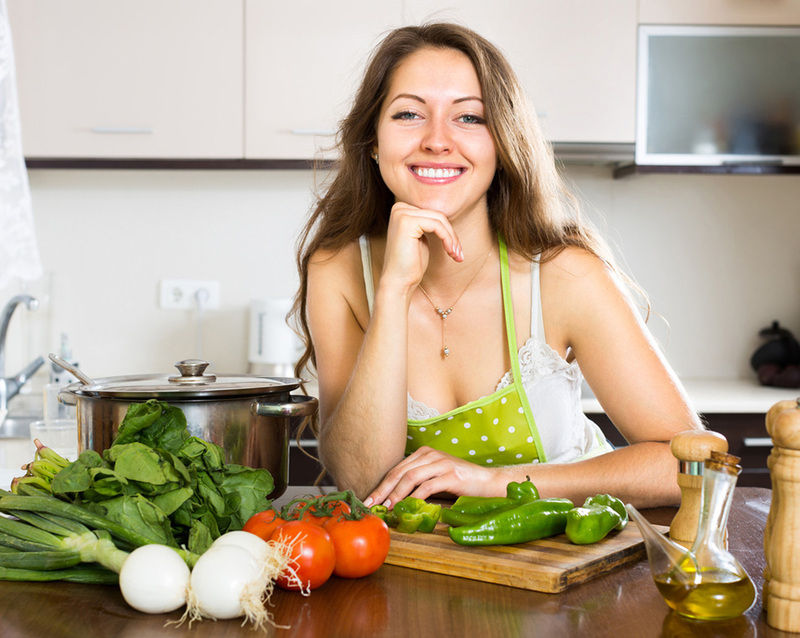 If you liked this article, check out: Kids cooking for tips on safety.